The squash and racketball section is one of the leading clubs in the North West of England. With 5 courts, including a glass back show court with seating for over 100 spectators, the facilities at the club are of a high standard. For those looking to get involved and play more squash, there are a number of options for you. Club Night – Saturdays 4-6pm – Our club night is open to all members of all abilities and is a great opportunity to meet other members and play some friendly matches. Throughout the season we enter 9 men’s teams in the North West Counties Squash League, 2 ladies’ teams who compete in the Cheshire Ladies Squash League and 1 racketball team. 1st Team – Our men’s first team plays in the NWCSL premier division, which has a number of World ranked adult and junior players. First team matches are played on Tuesday evenings during the season and all members are encouraged to get down to the club to watch world class squash free of charge. We run an extremely successful junior coaching programme, which has produced a number of county and regionally ranked players. Junior coaching is run on Saturdays 12.00-3.00pm and more information can be found here. 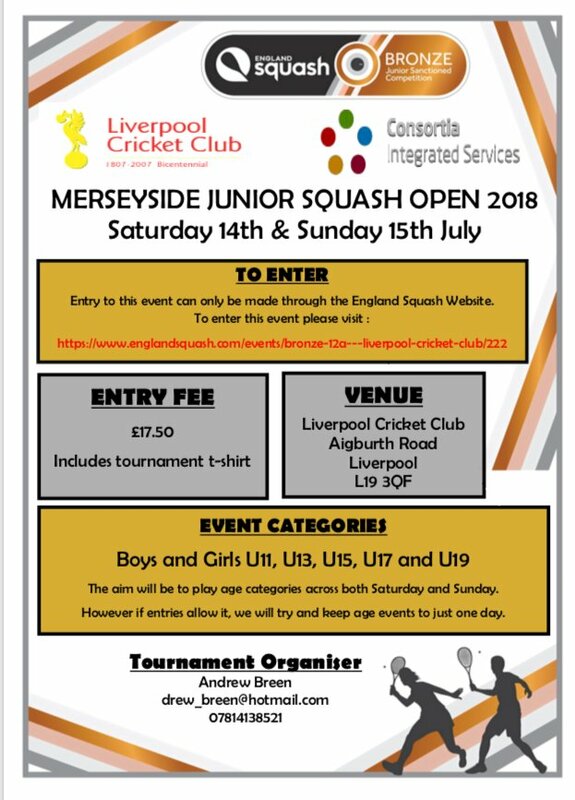 Last chance to enter this year’s Merseyside Junior Open. Closing date for entries is the Friday 22nd June.